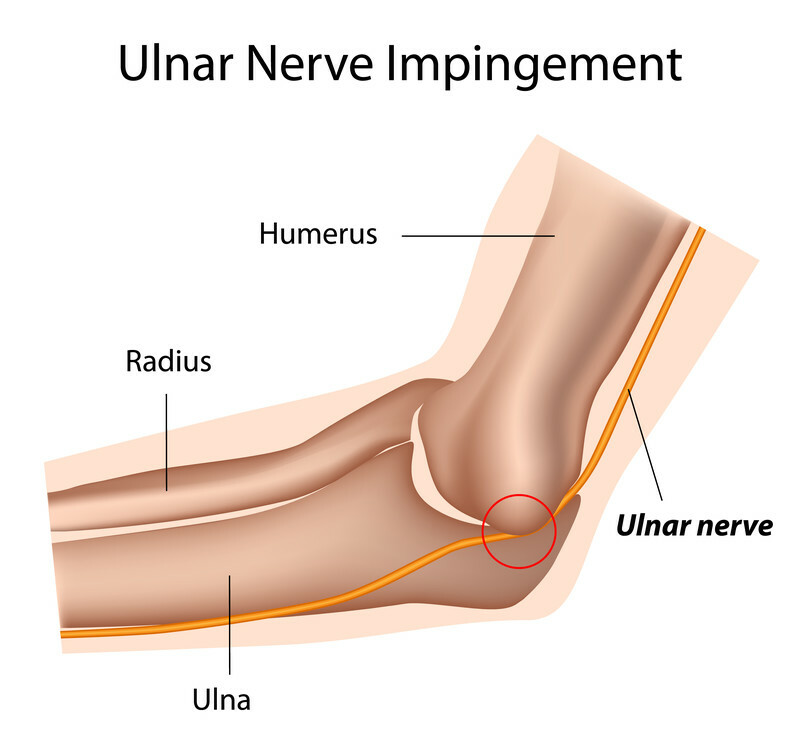 Cubital tunnel syndrome is caused by pressure on the ulnar nerve as it passes through the inside of the elbow, an area often referred to as the “funny bone.” At this site, the ulnar nerve lies next to the bone, with little padding over it, and is susceptible to pressure. Overuse: Repetitive bending of the elbow, such as with pulling, reaching or lifting can aggravate the ulnar nerve. Pressure: The nerve has little padding over it on the inside of the elbow. Habitual poor positioning during daily activities can cause nerve injury. Stretching: Certain positions can put traction on the nerve, causing aggravation. Swelling: After an injury to the area, such as a fracture or tendonitis, resulting swelling can put pressure on the nerve. Anatomy: The ulnar nerve runs in a groove along the inside of your elbow. Occasionally, the nerve can move in and out of this groove, leading to repetitive snapping of the nerve, aggravating it. Arthritis: Elbow arthritis can lead to bone spurs, which can place pressure on the ulnar nerve. Tingling, or “pins and needles” to the ring and small fingers. This may radiate up to the wrist, forearm and elbow. Loss of sensation, or “falling asleep”, to the ring and small fingers. Aching pain at the inside of the elbow, on the little-finger side of the arm. Weakness with pinching and lack of coordination with small items, such as buttons or coins. In advanced cases, a claw-like curling of ring and small fingers and an inability to use them to grasp items may occur. Muscles may atrophy if pressure on the nerve is severe or left too long without treatment. Fabricate a custom elbow splint , in a position of comfort, to allow your nerve to rest and heal. Treatment and modalities to decrease swelling. An individualized exercise program will be devised to fit your symptoms and functional hand use. Myofascial massage to loosen restrictive muscles and fascia which may be putting pressure on the nerve. Low Level Laser Therapy to facilitate nerve healing. If you are experiencing any of these symptoms, request an appointment here. We have clinics in Beaverton, Clackamas, Gresham and NE Portland to conveniently serve your injury needs.